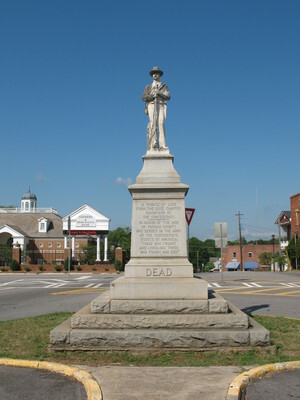 "Eatonton Confederate Monument, Eatonton, GA" by George Lansing Taylor Jr.
Eatonton Confederate Monument, Eatonton, GA. This historical sculpture was fabricated by McNeel Marble Works. The sculpture is made of Italian marble and the base of granite. It was dedicated July 22, 1908. It is located in Eatonton, Putnam County, Georgia.
" A tribute of love from the Dixie Chapter Daughters of the Confederacy In honor of the men of Putnam County, who served in the Army of the Confederate States of America; "Those who fought and lived, and those who fought and died." Around base : Our Confederate Dead " lest we forget." Taylor, George Lansing, Jr.; Lance Taylor; Photographers -- Florida --Jacksonville; Photograph collections -- Florida -- Jacksonville; Eatonton Confederate Monument; Confederate Monument; Army of the Confederate States of America; Confederate soldiers; Putnam County (Ga.); Eatonton (Ga.); morials --- Georgia --- Eatonton.